Sesshin means "touching the heart/mind". Since the time of the Buddha practitioners have gathered in community during the rainy season to deepen their practice and touch the true nature of Mind. Please join guiding our teacher Zoketsu Norman Fischer, resident teachers Myoshin Kate McCandless and Shinmon Michael Newton, and shuso Jikai Vicki Turay for this six-day residential retreat on the shores of pristine Loon Lake. For more information on our teachers click Teachers. Loon Lake Camp is located in the UBC Malcolm Knapp Research Forest, on a beautiful mountain lake outside Maple Ridge. Distance from downtown Vancouver is 60 km. Accommodation is dormitory style (2-4 per room), or double rooms in the new Johnson Building, which has one shared washroom for every two rooms. For more information, see the Accommodations page at the Loon Lake web site. This is a silent retreat which follows a monastic-style schedule. Full participation in the schedule is expected. Personal modifications to the schedule can be arranged to accommodate special needs, in dialogue with the teachers and ino (head of zendo) at the retreat. Please note special needs on your registration form, and check in with the ino at the beginning of the retreat if you have any questions or concerns about the schedule. 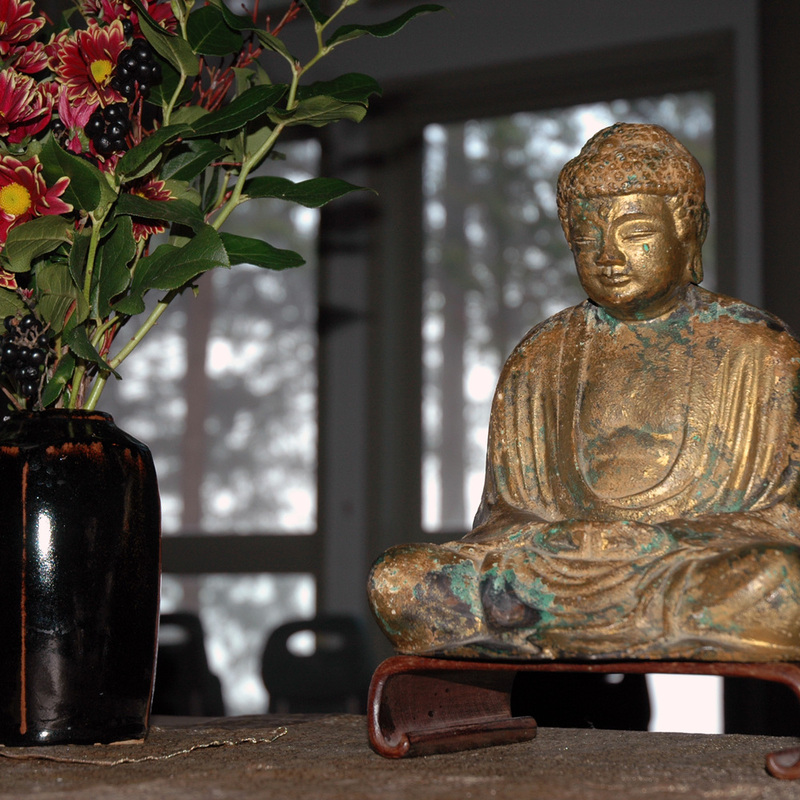 We recommend that you have some meditation experience prior to participating in this retreat. You are welcome and encouraged to join Mountain Rain Zen Community for an orientation at one of our regular Wednesday evening or Sunday morning sits, although this is not required. Practitioners from other traditions are warmly welcome. Please inquire if you have any questions about whether this retreat is right for you. Three delicious vegetarian meals are provided daily, as well as coffee, tea, and snacks. We are happy to accommodate special dietary restrictions providing you advise us in advance through your registration. Thank you for your understanding. Please register by Oct. 29, so we can order food for the retreat, and make room assignments. Single Rooms: A very limited number of single rooms are available for those with special needs on a first-come, first-served basis, in either the dormitory buildings or Johnson Building. Please make your request for a single room on the Additional Information Form. Reduced fees available to those on a limited income: see below. Retreat fees cover expenses only. Dana (donations) to the teachers can be made at the retreat. We ask that half-time attendees arrive only at the beginning of the retreat or by noon on Tuesday, Nov. 15 (in time for lunch). If you have never attended a Zen sesshin and can only attend half-time please plan on coming for the first half of the retreat so that you can be there for the orientation and oryoki training. On the Additional Information form that pops up when you press "Continue Registration," indicate part-time attendance and provide your arrival and departure dates/times. If space is available, half-time attendees who can attend the first half, but not all of the second half, may stay extra nights, on a per-night basis. Requests must be made to the registrar. Reduced fees are available for those on a limited income. To request a reduced fee please fill out a Reduced Fee Request form. (Click the link to open the form.) Then register below, select the "Reduced fee/dormitory" option, and pay the $50 deposit. You will pay the balance when you arrive at Loon Lake. Note: If you're requesting a reduced fee and require a Single Room due to special needs, please follow the registration instructions above and make your describe your needs in on the Additional Information form, which will pop up after you click the accommodation and oryoki boxes. Or contact the registrar: registrar@mountainrainzen.org. On the Additional Information form that pops up when you press "Continue Registration," complete the section on Reduced Fee Requests. The registrar will contact you. No one will be turned away for lack of funds. Upon receipt of your registration the registrar will send you a confirmation letter with further information about the retreat. If you still have questions or concerns, contact the registrar at registrar@mountainrainzen.org. Please note: Loon Lake Registration is now on a Waitlist basis. Please contact the registrar at registrar@mountainrainzen.org to be put on the list and do not register without prior permission.